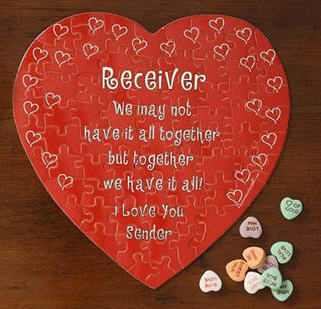 Let someone special "piece together" how you really feel! Colorful design is printed on sturdy, white cardboard. Puzzle includes 75 pieces and measures 7 1/4"W. Unassembled puzzle pieces are placed in a clear, resealable plastic bag. Handsome velvet drawstring bag is also included making it ready for gift-giving and providing protective storage for years to come. Personalization Details: Receiver's and sender's name each up to 15 characters.